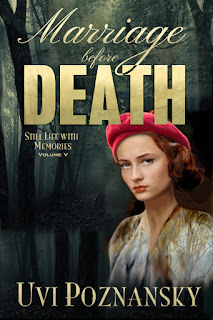 Marriage Before Death is book five of the author’s Still Life with Memories series but can easily be read as a standalone. In fact, I have come to this series with this particular story and it has made me want to now read the others – each focuses on a particular main character’s point of view. In this story, Lenny is the central character and he is in a lot of trouble. This is wartime and he has been rounded up as a suspected spy. He is one inch away from a hail of bullets when a girl appears, dressed in the floweriest of hats. There is something familiar about her but he can’t quite put his finger on what it is. Her name is Rochelle and she makes the most extraordinary accusation. Then she tells the SS officer that Lenny must marry her. He must marry her right before he dies. This was a touching, well researched story. I always hate it when historical fiction gets important details wrong and this author has done her homework. More than that, Uvi Poznansky’s lyrical prose shines through and gives this story a haunting, unforgettable quality. In addition, her sensitive handling of a much-changed Rochelle is touching and oh-so-real. Now off to acquire the others in the series.